The Biodiversity Management Bureau (BMB) is calling for more multi-sector collaboration on conserving and protecting the critically endangered Philippine eagle (scientific name 'Pithecophaga jefferyi') -- the country's national bird and an indicator of ecological health. During BMB's celebration of the 2018 Philippine Eagle Week (PEW) on Saturday, BMB Director Crisanta Rodriguez said the collaboration will help build upon previous conservation and protection successes, such as the increase in Philippine eagle's population. "Collaborative conservation and protection of the Philippine eagle proved cohesive action and a supportive society can prevent the species' extinction," she said. From an estimated population of only 100 in 1969, she said the Philippine eagle's population already reached 400 to 500 pairs. Among recent findings are discovery of a Philippine eagle in Leyte Island - where it was thought to be extirpated due to no reported sightings for 30 years. "We confirmed new distribution record in the Cordilleras with an active nesting site located in Apayao province," she added. She also said the environment department's joint surveys with Haribon Foundation resulted in the discovery of Philippine eagle breeding pairs and nests in forests of Gabaldon and Bongabon in Nueva Ecija province. BMB-Wildlife chief Josefina de Leon said Philippine eagles are found in mainland Luzon, the Visayas' Samar and Leyte islands, as well as mainland Mindanao. Citing results of DNA tests by BMB and University of the Philippines, she said Philippine eagles found in such areas share the same genetic make-up unlike other species. "There's no sub-species of Philippine eagle yet," she said in the same event. The International Union for Conservation of Nature's Red List already classified the Philippine eagle as critically endangered, citing the bird's "extremely small population" that experienced "extremely rapid" decline over the past three generations due to extensive deforestation in the country. Critically endangered species are those considered to be facing an extremely high risk of extinction in the wild, the list noted. This year's PEW celebration is anchored on the theme "Ipagdiwang ang pagkakaisa para sa malayang agila!" to highlight urgency for all sectors' continuing concerted efforts to save the Philippine eagle from extinction. Proclamation 79 series of 1998 declared June 4 to 10 of every year as PEW and cited need for such efforts. 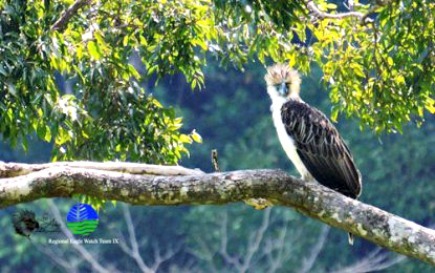 BMB and its partners continue advocating concerted action, noting that the Philippine eagle - among Earth's rarest, largest and most powerful birds - is endemic to the Philippines and has no close relatives among living eagle species worldwide. This made the bird a biological heritage gem. Birds of prey like the Philippine eagle are predators at the top of the food chain and control population of small animals by preying on these - helping promote ecological balance while protecting other species, the partners noted. "The Philippine Eagle is embedded in oral histories and other cultural artifacts of several indigenous groups in the country so this indicates that it performs a role in the human production of unique cultures," said Philippine Eagle Foundation (PEF). PEF also said the presence of a healthy population of eagles can fuel eco-tourism, a source of livelihood for communities near these birds' territories. Conservation and preservation likewise promote healthy forests which in turn help control soil erosion, mitigate climate change's effects, minimize flooding and serve as sources of food, medicine, clothing and shelter, PEF noted. Rodriguez said the BMB, private groups, LGUs concerned and indigenous local communities continue protecting habitats nationwide including those that Philippine eagles are known to occupy. She also said PEF trained indigenous peoples as green guards, 586 of whom are already monitoring Philippine eagles in Mindanao. "Conservation breeding of the species at Davao-based Philippine Eagle Center managed by PEF produced the first captive-bred Philippine eagle 'Pag-asa' in January 1992," she said. "To date, 28 eagles have been bred at the center. Protocols on release of eagles back to their habitats were developed through arduous experiments. With the spearheading role of PEF, two Philippine eagles have been successfully released to the wild. One of these - the eagle released in Manolo Fortich, Bukidnon in March 2015 - registered the first ever recorded successful breeding in March 2018. With renewed confidence, we look forward to seeing more captive eagles released back to their natural home." Proclamation 615 series of 1995 declared Philippine eagle as national bird of the Philippines. Aside from being the flagship species in conserving Philippine wildlife, the proclamation said such bird is a source of national pride.